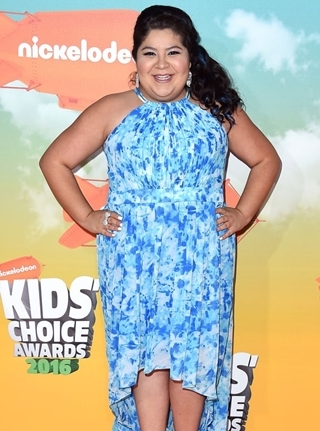 The American actress and singer Raini Rodriguez was born on July 1, 1993 to Diane and Roy Rodriguez. Her career began when she was first discovered by a talent agent at an IMTA showcase. Raini was just 11 years old at that time and in order to pursue her acting career, she moved to Los Angeles with her mother and brother. She first started through a guest role in television series Huff during 2006 and after having a few more small roles in different series, Raini got her big-break during 2011 with a role as Trish in the popular TV show, Austin & Ally. Apart from her work over television, the actress has also been making a name for herself in the film industry. She started with minor role in 2007 movie Parker and afterwards has landed more notable roles in films like Paul Blart: Mall Cop, Prom, Girl in Progress and Paul Blart: Mall Cop 2. Check the complete list of actress Raini Rodriguez body measurements including her weight, height, dress, shoe, bust, waist, hip and bra cup size. She is actually afraid of heights. The actress loves to watch horror movies. She was discovered by a talent agent at the age of 11. Raini Rodriguez is shortest among the cast of Austin & Ally.